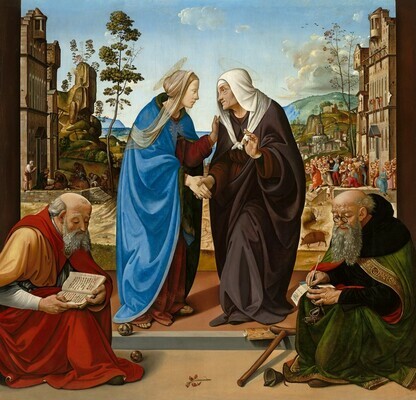 The central scene of the eccentric Florentine artist Piero di Cosimo's Visitation depicts the meeting of the Virgin Mary and the elderly Saint Elizabeth, the mother of John the Baptist. Saint Nicholas on the left, identified by his attribute of three gold balls alluding to his charity towards the daughters of an impoverished nobleman, and Saint Anthony Abbot on the right, identified by his cane, bell and ever-present pig, sit in the foreground as studious witnesses to the event. Additional scenes relating to the birth of Christ are depicted in the background: the Annunciation painted on a distant church wall, the Nativity and Adoration of the Shepherds on the left, and the Massacre of the Innocents in the middle ground. Piero's Visitation has an unbroken history, having been first described in 1550 by the artist-biographer Giorgio Vasari in his Lives of the Artists as an altarpiece painted for the Capponi family chapel in the church of Santo Spirito in Florence. The heightened realism of the painting probably has its source in Flemish art, in vogue in Florence at the time. Piero's composition, with a main central group and a saint on either side, recalls the traditional triptych format. However, its pyramidal quality, with the saints forming a base and the heads of Mary and Elizabeth as the apex, reflects the influence of recent work by Leonardo da Vinci. Commissioned 1489/1490 for the Cappella Capponi of San Niccolò, Santo Spirito, Florence; moved 1713 to the Villa Capponi a Legnaia, near Florence. The Hon. Mrs. Frederick West [c. 1772-1843, née Maria Myddelton, the second wife of Frederick West], Chirk Castle, south of Wrexham, Wales; by inheritance to her son, Frederick Richard West [1799-1862], Chirk Castle, and Ruthin Castle, west of Wrexham, Wales; by inheritance to his son, William Cornwallis Cornwallis-West [1835-1917], Ruthin Castle, and Newlands Manor, Milford on Sea, near Lymington, Hampshire. (Thomas Agnew & Sons, London); (Duveen Brothers, Inc., New York), by 1933; sold 1937 to the Samuel H. Kress Foundation, New York; gift 1939 to NGA. Old Masters Exhibition, Royal Academy, London, 1891, no. 154. Italian Paintings of the XIV to XVI Century, Detroit Institute of Art, 1933, no. 40. Masterpieces of Art. European Paintings and Sculpture from 1300-1800, New York World's Fair, 1939, no. 284, repro. Duveen Brothers. Duveen Pictures in Public Collections of America. New York, 1941: no. 125, repro. Preliminary Catalogue of Paintings and Sculpture. National Gallery of Art, Washington, 1941: 153, no. 454, as The Visitation with Two Saints. Book of Illustrations. National Gallery of Art, Washington, 1942: 248, repro. 167, as The Visitation with Two Saints. Cairns, Huntington, and John Walker, eds. Masterpieces of Painting from the National Gallery of Art. New York, 1944: 42, color repro., as The Visitation with Two Saints. Paintings and Sculpture from the Kress Collection. National Gallery of Art, Washington, 1945 (reprinted 1947, 1949): 60, repro., as The Visitation with Two Saints. Paintings and Sculpture from the Samuel H. Kress Collection. National Gallery of Art, Washington, 1959: 74, repro., as The Visitation with Two Saints. Walker, John. National Gallery of Art, Washington, D.C. New York, 1963 (reprinted 1964 in French, German, and Spanish): 87, repro., as The Visitation and Two Saints. Summary Catalogue of European Paintings and Sculpture. National Gallery of Art, Washington, 1965: 103. Cairns, Huntington, and John Walker, eds. A Pageant of Painting from the National Gallery of Art. 2 vols. New York, 1966: 1:58, color repro. European Paintings and Sculpture, Illustrations. National Gallery of Art, Washington, 1968: 91, repro. Shapley, Fern Rusk. Paintings from the Samuel H. Kress Collection: Italian Schools, XV-XVI Century. London, 1968: 118, fig. 286. Finley, David Edward. A Standard of Excellence: Andrew W. Mellon Founds the National Gallery of Art at Washington. Washington, 1973: 79. Shapley, Fern Rusk. Catalogue of the Italian Paintings. 2 vols. National Gallery of Art, Washington, 1979: I:369-371, II:pl. 268. Watson, Ross. The National Gallery of Art, Washington. New York, 1979: 28, pl. 12. Walker, John. National Gallery of Art, Washington. Rev. ed. New York, 1984: 102, no. 70, color repro. European Paintings: An Illustrated Catalogue. National Gallery of Art, Washington, 1985: 312, repro. Kopper, Philip. America's National Gallery of Art: A Gift to the Nation. New York, 1991: 156, color repro. National Gallery of Art. National Gallery of Art, Washington. New York, 1992: 25, repro. FIDELIO, Journal of Poetry, Science, and Statecraft, Washington, DC., 1997, front cover, repro. Faxon, Alicia Craig. “Visiting/Visitation." In Encyclopedia of Comparative Iconography: Themes Depicted in Works of Art. Edited by Helene E. Roberts. 2 vols. Chicago, 1998: 2:927. Hand, John Oliver. National Gallery of Art: Master Paintings from the Collection. Washington and New York, 2004: 33-34, no. 23, color repro. "Vasari and the National Gallery of Art." National Gallery of Art Bulletin 48 (Spring 2013): 12-13, repro. Hirschauer, Gretchen A. "Piero di Cosimo: The Poetry of Painting in Renaissance Florence." National Gallery of Art Bulletin no. 51 (Fall 2014): 30-31, repro. Kennicott, Philip. “An Enigmatic Giant of Renaissance Art Will Get D.C. Show.” Washington Post 137, no. 232 (July 25, 2014): C6, color fig.